In the past two days the internet has been buzzing over this video on the Kenyan vlogger’s use of the Kenyan Anthem. The video was discussing their views on some of the greatest national anthems while sampling them for their audience. To their surprise their video was flagged for a copyright infringement claim. Which is what most serious owners of content do online to effectively monetize their content. So of course, the raging debate is how the said publisher has laid copyright claims over what is viewed as our National Heritage. 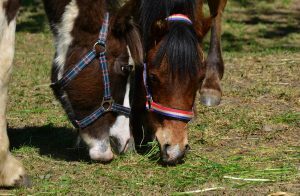 To put into context, I shall discuss the proverbial two horses (read legislation) our Government created and how one is giving and the other is taking, possibly due to poor communication between two state bodies and questionable legislative drafting skills. A common universal trait about intellectual property registrations and claims, is that at one point they all revert to the public domain when their time lapses; be it patents, utility models, industrial designs and copyright. Trademarks are a little of an exception because the owner can renew their trademark claims up until it no longer makes commercial sense to maintain them. Now, with this in mind, it is why intellectual property law practice and protection is a game of smarts. You have to be aware of all the intricacies to pick an efficient protection strategy for any works in question. In my view, we tried to be a little too clever and fumbled with the protection of our National Anthem. We have the Copyright Act on one had and the National Flag, Emblems and Names Act. One piece of law which is the Copyright Act, confers copyright rights to Government but such rights expire upon lapse of 50 years from the day its made available to the public and reverts to the public domain. The rationale behind public domain is that it becomes free to use for all. 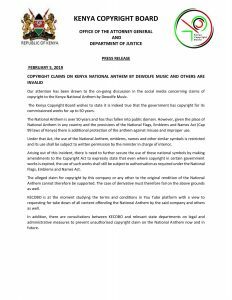 I highly doubt that this would be a deliberate intention for our national symbols, emblems and the anthem itself which identify us as a country, And with this in mind, I ask myself why was the Act did not particularly state it clearly from the beginning that such should be exempt from the Act and be State property in perpetuity? It should have been obvious that fifty years can simply fly by and such a conundrum would have been avoided! No? In addition, as a country, we have ratified the Paris Convention of the Protection of Industrial Property which we ratified in 1965. Under Article 6ter, there are mechanisms provided for to remind countries to protect their national symbols from registration or use without their consent. There is a further provision for countries to register these properties with the International Bureau so that there is no doubt as to what countries own in regards to their national symbols. I am uncertain as to whether we have done this as a Republic. If we haven’t we should! Let us not rely on the perceived “obviousness”. In my view, the relevance of the Paris Convention applies to the Anthem in the context of a National Symbol, which is what it is largely viewed as more than an issue of copyright. Also, I would like to imagine the same mischief applies in our National Flag, Emblems and Names Act judging from the drafting. On the other hand, we have the National Flag, Emblems and Names Act, which provides and outlaws the “misuse and insulting use” of the National Anthem under Section 2B. In my view, these terms need to be defined, because left to individual interpretation can lead to some very interesting situations and unnecessary arrests and fines. Do you remember growing up a certain political regime where one could not even use the Kenyan flag on a t-shirt or any apparel? I digress. With this law in place the Copyright Act, Section 25(2) , how can we restrict the use of something that has “lawfully” reverted into the public domain? It completely defeats the purpose of public domain in my view. During my law school days, one of the lessons inculcated in our aspiring legal minds was how an ambiguous law is a bad law and the perils that come with such uncertainty. We need to pull our socks and do better when it comes to drafting laws; work on purposefully engaging and hiring competent professionals in their various areas of legal expertise to offer guidance and direction. Otherwise, we end up looking like a very confused lot; especially to the international community. All in all, I believe all is not lost. The principle of sovereignty shall save us I think, and we can remedy the situation. With this situation at hand, we have the opportunity to do better in securing what is rightfully Kenyan in the both local and international legal frameworks we have in place. We need a review on how we can stop being viewed as “victims” most if not all the time when it comes to intellectual property ownership in the international space. The various state agencies need to work together, KIPI, KECOBO, Kenya Tourism Board, County Governments. It’s time!!! We need to stop fumbling with such important issues. Remember that Kiswahili saying, “Mpanda farasi wawili, hupasuka msaba.” – He who attempts to ride two horses at the same time will eventually rip apart from the middle! We need to be clear, deliberate and concise in matters intellectual property law in Kenya! Intellectual Property is everywhere its about the what and the how to protect. NextNext post:‘Hakuna Matata’ Trademark. Stop Overreacting!